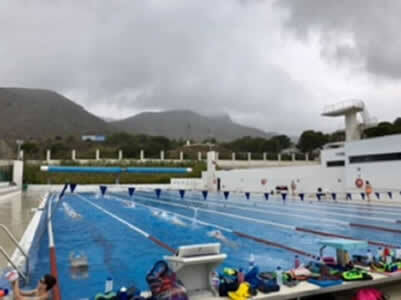 In 2015 Thame Swimming Club (with Didcot Barramundi Swimming Club) embarked on its first Swim Training Camp to Torremolinos in Spain. Here’s why TSC started running this annual trip. Swim camp was created to teach developing athletes the importance of good stroke technique. Camps are usually designed to incorporate a mixture of training with skill work. This idea of thinking critically is what creates the best athletes. Stroke technique is important for developing swimmers because it opens up an opportunity to ask questions during a session and allows swimmers to learn something new. We all know how daily sessions are run; with tight intervals and little time for sitting on the wall. This is great for training purposes, however, for developing swimmers, it often takes away from the importance of perfecting a stroke before building bad habits. Swim camps are designed around critical “skills and drills” sessions that allow for developing athletes to correct techniques before they become bad habits. Camp is a time to grow as an athlete within the sport, but also a time to grow as an individual. Part of growing up comes from making new friends, and what better way to make friends than to meet people at camp? The friendships that developed between Thame and Didcot Barramundi swimmers at the 2015, 2016 and 2017 camps have extended beyond camp and brought the 2 clubs together which manifests in them supporting each other in local, regional and national galas. In 2018 Thame Swimming Club is pleased to be sharing the camp with Wantage White Horses Swimming Club and looks forward to forging firm friendships between the swimmers of both clubs. Yes, training is still important at swim camp. After all, you did sign up for swim camp. However the intensity level and time available to complete training sessions will vary. Where there is more training incorporated into the camp, you don’t want to overthink the difficulty of the next set, and your capabilities beyond that. Try to learn something from the coaches, whether it be a new training style, or just working on a new technique during a set. Find something that will help make you a better athlete. Camp is a challenging process that opens up the door to a different kind of mental and physical toughness; however, it makes up for the typical fun through persevering experiences and memories. The Swim Camp at Torremolinos over the last 3 years has offered swimmers the chance to grow athletically and individually. Camp activities ranged from training, technical work, land training to evening team games and an afternoon trip to Crocodile park or crazy golf! What is the Criteria for Swim Camp – can any swimmer attend? Due to the physical and emotional demands of the camp, we recommend that swimmers who wish to attend are 13 years old on the day of travel and that they swim on average 7+ hours per week. To take swimmers who do not meet these criteria is a decision made by the Head Coach and is made in partnership with both the parents and swimmer. The camp has run each October half term for the last 3 years at the same location: Torremolinos, Malaga Spain. Flights are from Gatwick to Malaga from Saturday to Saturday! This location has great facilities with 2 50m pools (indoor and outdoor) and land training facilities including a running track. The hotel is well situated within a 15 minute walk to and from training which adds to the location exercise. In the first year at camp swimmers swam 65+ kilometres over 22 hours and walked at least 10K per day as well as joining in land training sessions, these land training sessions were increased in the second year to 1-2 hours daily. The swimmers return tired but energised! We have been fortunate in the past to gain sponsorship for camp kit, which includes 2 swim hats, a t-shirt and sweatshirt. This enables swimmers to be easily identifiable in the airport, hotel and the pool. Whilst the swimmers are away we ensure that there is a fun trip organised for a well deserved afternoon off from training and a meal out in a local restaurant. We fund this through our easy fund raising site and the odd cake sale!